One of the joys of being the Executive Director of the Society for the History of Navy Medicine is that, on occasion, a person will find me on the internet and offer to share something about a relative who served in the Navy, typically, in World War II. Such was the case when I received an email from the daughter of Ken Crawford, PhM2, USNR. Ms Crawford made mention that she held her dad’s “Anniversary Booklet” for the United States Naval Receiving Hospital, San Francisco, and asked where she might donate it. I referred Ms Crawford to the archivist at the Navy’s Bureau of Medicine and Surgery, in Falls Church, VA. But first, I asked if I might have an opportunity to see the booklet for my own research purposes. The little treasure arrived in my mail today. According to the Booklet, the hospital was originally assembled at the Medical Supply Depot in Brooklyn, and later expanded “in echelons” at the Naval Supply Depot in Mechanicsburg, Pennsylvania. Shipped to California in September, 1944, the hospital’s 61 “task force-type” buildings found their home in Crocker Amazon Park, at Geneva Ave and Moscow Street in San Francisco. Commissioned on 9 December 1944, the hospital staff included 11 medical officers, 4 dental officers, 50 nurse corps officers, 11 hospital corps officers, 10 pharmacists, 2 chaplains, 2 supply officers and a Marine Corps officer and more than 600 enlisted people including (more than 500) pharmacists’ mates, storekeepers, seamen, Marines, and 43 cooks. The number of patients this seemingly ample staff served is not noted in the Anniversary Booklet. The hospital’s missions were to receive overseas casualties, provide hospital services for nearby naval activities and “to act as a training center for newly indoctrinated medical officers and hospital corpsmen”. As Robert C Fenning, LT (jg), Chaplain Corps, USNR wrote in the booklet, “To the returning casualty Fleet Hospital 113 was a pause for adjustment. On home soil again, he could offer thanks…” The hospital offered a full agenda of entertainments and activities including stage shows, celebrity visits (Walter Winchell, Jack Dempsey, Helen Hayes and Eddie Foy, Jr. are specifically mentioned), dances and sports activities. 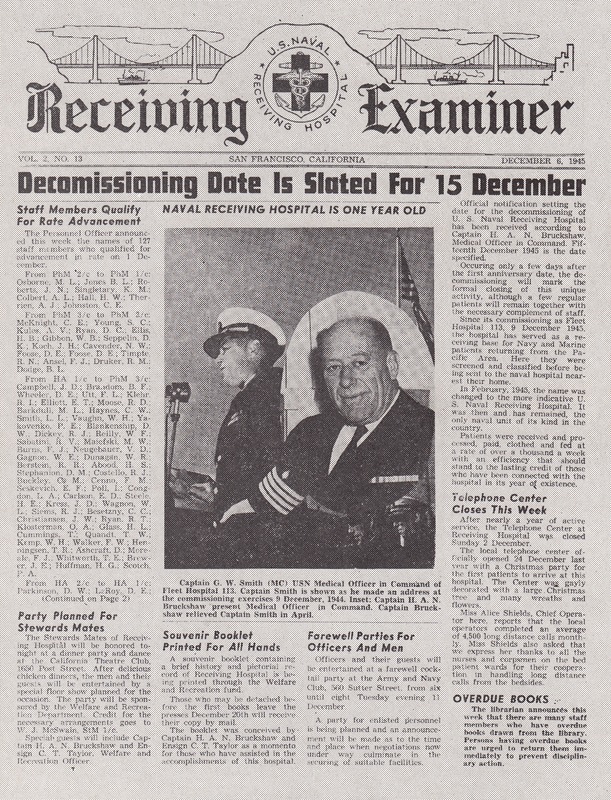 With the war over and patients eager to go home, the hospital was scheduled for decommissioning on 15 December 1945, just a year and a week after its commissioning. According to the ParkScan website, the Navy vacated the site in 1946, and the structures turned over to the San Francisco Housing Authority for use as veterans’ housing during the post-war housing shortage. The park returned to recreational usage in 1957. I’m going to take a brief sabbatical from these federings: I just took office as the first president of a newly chartered Rotary club. 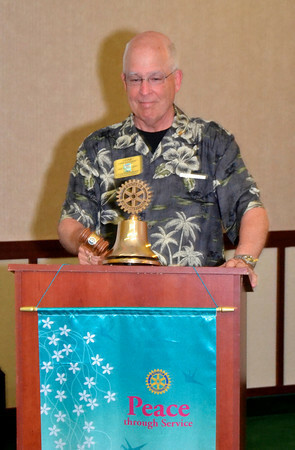 Rotary Club of Solano Sunset Inaugural President Tom Snyder Strikes the Bell for the First Time. Note that “Peace through Service” is RI’s 2012-2013 byword. It’s a “new-model club” designed to meet the needs of today’s younger, busier Rotarians: we meet during commute hour, for 45 minutes only; hors d’oeuvre, no sit-down meal; youngish (you wouldn’t know it by looking at the club president…); about a third of members are married couples; ~50% women; high energy – and as a new club, we are setting our own precedents as we go along. Needless to say, a lot of planning needs go into our first few weekly meetings. On top of that, we will have a big blow-out Chartering Celebration at the end of the month, and there’s much planning for that! I think I’ve written a bit about Rotary International before. Despite its image as a social club for old white guys, “RI”, as it’s known, is much more than that. There are about 1.2 million Rotarians in something like 34,000 clubs in most countries of the world. The Rotary motto is “Service Above Self”, and this mantra manifests itself in innumerable local community projects (Rotarians seem to favor things like literacy, child and maternal health, community sports and recreational facilities) and international work. It’s in International Projects that Rotary multiplies its impact, by working with Rotarians “on the ground” in regions of need. With sustainability as a central criterion, Rotary clubs in more wealthy nations work with local clubs in Africa, Central and South America, India and even China (though Communist nations are wary of involvement with such a “Capitalist” icon as Rotary) to create safe water supplies, open and maintain health clinics, start and sustain elementary and secondary schools, and much, much more. On top of individual club-to-club efforts, Rotary as an institution funds a huge youth exchange program. Each year, RI and individual Rotary clubs sponsor about 8,000 international student exchanges. High school students, usually in their junior or senior years, travel to a host nation for a year of school and cultural experience. Local Rotary clubs host these students, and local Rotary families house them. Rotary also sponsors an international Peace and Conflict Resolution program in partnership with universities in Thailand, Japan, England, Austrialia, Sweden and the US. More than 500 Peace Fellows have graduated from these programs; many have gone on to establish peace and conflict resolution programs in their own locales. Since 1947, Rotary International has sponsored more than 41,000 Ambassadorial Scholarships for undergraduate, graduate and vocational education all around the world. While studying in their host countries, Rotary Ambassadorial Scholars act as goodwill ambassadors for their home countries; when they return to their homes, they become ambassadors of their host countries while applying the knowledge they gained from their Ambassadorial studies. Finally, there’s Polio Plus. This Rotary program to eliminate the scourge of Poliomyelitis from the entire world started with a successful project initiated by two Filipino Rotarians. Then, 25 years ago, Rotary International adopted the idea and took it “international”. Along the way, RI teamed up with the Centers for Disease Control and the World Health Organization, while Rotarians and their friends “on the ground” strove to immunize billions of children and adults. In India, for instance, immunized kids receive an indelible black ink mark on a finger. Then, Rotary workers flood train stations and other gathering places calling out “show me your finger!” Kids who don’t have the marked finger receive the oral vaccine on the spot. Last year, India was taken off the list of nations with endemic polio. Now only Nigeria, Afghanistan and Pakistan remain. The Taliban institutes cease-fires when Rotary teams arrive in villages to immunize the residents. This past year, Rotarians contributed more than $215 million in response to a Bill and Melinda Gates Foundation challenge. The Challenge having been met, the Foundation kicked in $355 million – its largest grant to date. That means Rotary and its partners now have more than $570 million to finance the final push to eradicate polio. Interested in becoming a Rotarian? We are a by-invitation-only organization. Contact a Rotarian you know to talk about joining a local Club. I believe you will not regret becoming a part of such an important Force for Good in the world. Don’t know a Rotarian? Just look for the Rotary pin (identical to the logo, above) that most Rotarians wear with pride on their lapels or collars. The world of science is all aTwitter (sorry) about CERN’s announcement this week that they have confirmed the existence of the long-predicted Higgs Boson. See this video for a quirky explanation of the importance of the phenomenon. Our historical discovery this week isn’t in Higgs Boson league, but it’s quirky, I think. It comes to us from several commentaries on the American landings in Cuba during the Spanish-American War. 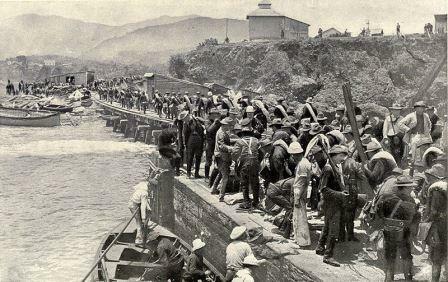 For reasons the tacticians will have to weigh in on, US troops landed at a coastal town near Santiago de Cuba. Turns out there was an iron mine in the area, manned by U S engineers. These yanquis apparently adopted a local Cuban concoction of rum, lime juice and sugar and added the innovation of ice, thereby creating a libation suitable for relaxing after a hard day in the mines. Urban legend holds that a U S Navy medical officer, LT Lucius W Johnson, fell in with the engineers and became enamored of the cooling, soothing combination. 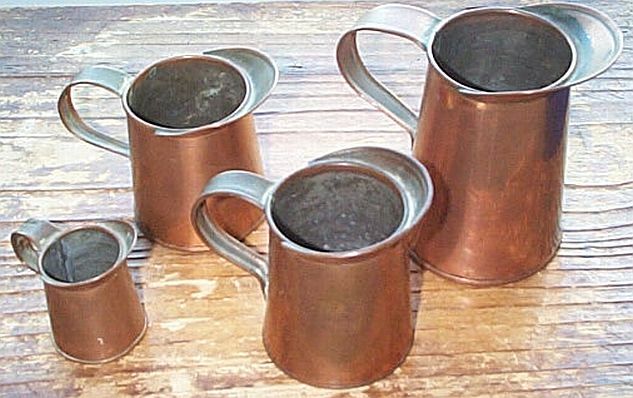 So pleased was he with his finding – no doubt Johnson appreciated a good scurvy preventative when he saw one – that the good doctor brought the recipe – plus a good stock of rum – back to the States with him, and introduced the drink to his friends at the Army Navy Club in Washington DC. Thus, according to legend, was the daiquirí – named after that Cuban mining town – introduced to American tiplers. 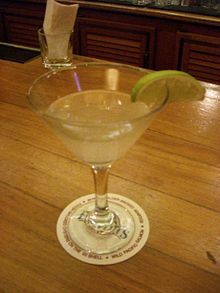 The drink became especially popular during World War II, when, with encouragement from FDR’s Good Neighbor Policy, importation of rum made that important daiquirí component especially plentiful and cheap. Historians – and internet commentors on drink – don’t discourse on what role, if any, Johnson’s association with the daiquirí played in his subsequent promotion to Rear Admiral, Medical Corps. Shake over cracked ice until very cold, then strain into a martini glass. Garnish with a lime wheel if you wish. Sounds perfect for a hot summer afternoon.